It’s day three of LFWM, and this morning we’ve seen Xander Zhou send pregnant male models down the runway, and a fully-grown man ‘born’ from a cube, as part of Samuel Ross’s latest vision for A-COLD-WALL* – so far, so intense. 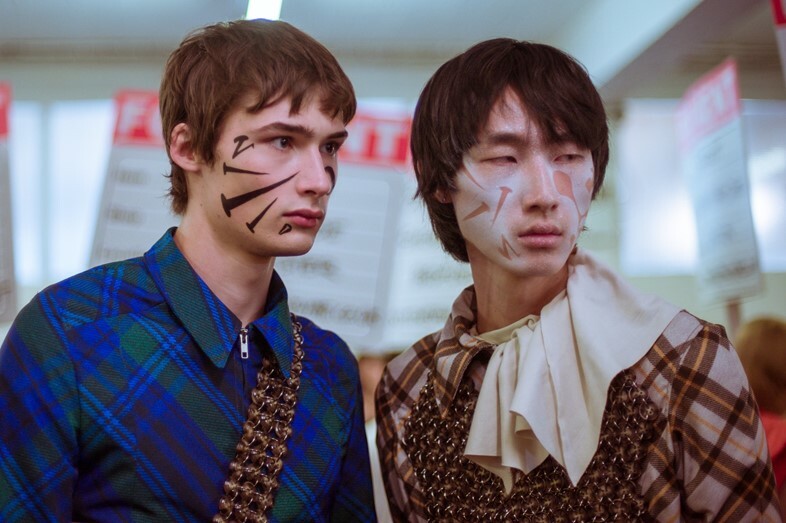 Next up, though, was the always fun MAN show at Brick Lane’s Old Truman Brewery, where Dazed 100-er Stefan Cooke, Art School, and Rottingdean Bazaar presented what they’ve been working on this season. And while Naomi Campbell might not have taken her turn on the catwalk this time around, there were still a few familiar faces on the line-up, and plenty to see. Stefan Cooke and partner Jake Burt found beauty in mundanity once more for SS19, as they recalled the excitement of the beginning of the school holidays that slowly dissipated into boredom by the end. “We were thinking about our older brothers and uncles who were teenagers when we were kids, and catching glimpses of them as they came and went throughout the summer,” explained Burt backstage. “There was something quite masculine about the idea, so there are masculine shapes throughout the collection, but they’re offset with things like feathers and the glimmer of bottle caps.” The concept manifested itself in tailored two-piece suits in clashing plaids, indigo denim jeans with maribou-trimmed waistbands, and digitally-printed ‘knitwear’, as well as chainmail-style strings of branded buttons – with some looks strung with up to 7000 of them (‘daisy chains on steroids’ as the show notes put it). Also bowing out of Fashion East and Topman's MAN initiative alongside Rottingdean Bazaar this season is Art School, who, for SS19, presented a collection with the gender queer body in mind – trans-aware tailoring was at the forefront of designers Eden Loweth and Tom Barratt’s minds, according to the show notes. What did this entail? A series of fluid tailored styles, sequined sheath dresses, mini skirts, slashed t-shirts and feathered stilettos. 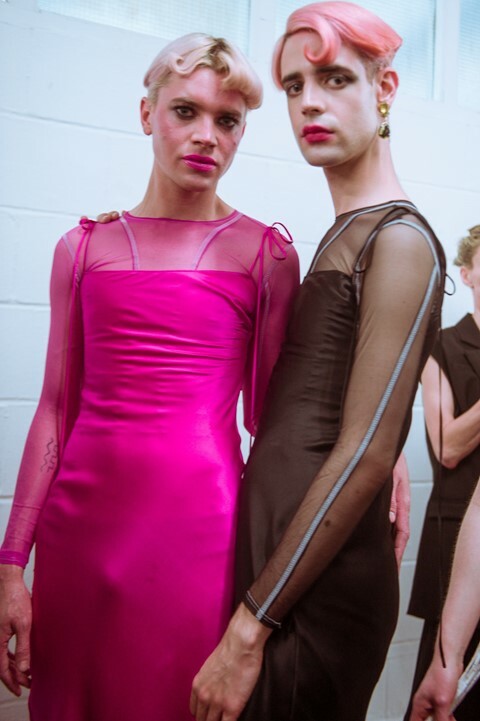 Representation, as always, was key, as the duo continued to blur the line between gender and build a dialogue around the shifting landscape of fashion. 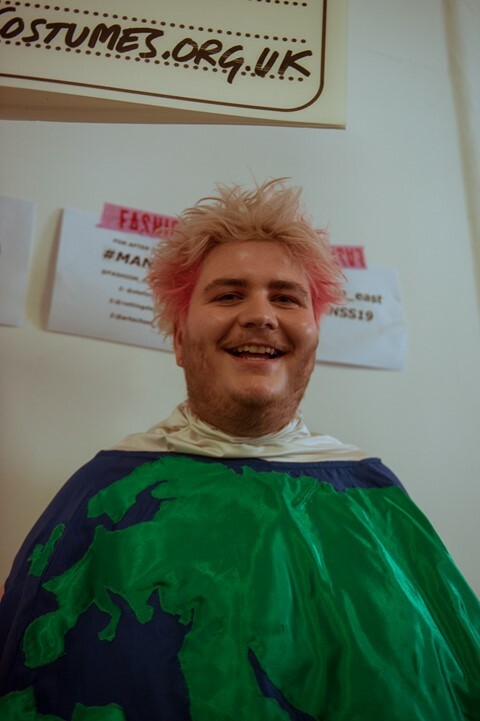 Fresh from collaborating with Mica Levi and Vivienne Westwood on their show Cowpuncher, Dazed 100-er Holly Blakey was on hand to choreograph Art School’s ‘High Concept Characters’. With glitter and mascara streaked down their cheeks, seemingly on their way back from a wild night out (one we’d quite liked to have been on, tbh), the models stumbled their way down the catwalk with arms outstretched, with some falling and crawling as they went. Having strutted down the catwalk alongside Naomi Campbell (okay, carrying a cardboard cut-out of her) at last season’s Rottingdean show, ‘it-girl and horrible boy’ Harry Freegard was back, this time taking his turn dressed in a Planet Earth costume, alongside artist Julie Verhoeven, who walked dressed as a Christmas tree (baubles flying everywhere). 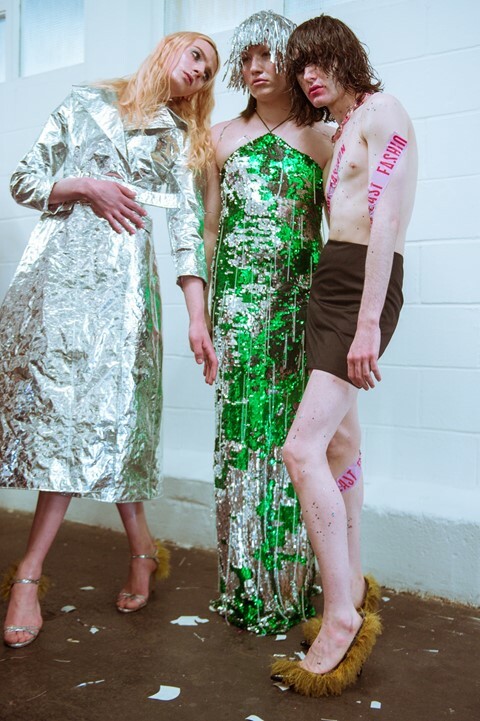 Opening for Art School was HRH Princess Julia, in a slashed t-shirt and sequined skirt, followed by Dazed 100 model and activist Munroe Bergdorf – who, according to the show notes, served alongside artist Josephine Jones as a big inspiration for the collection.